Mix eggs, yolk and sugar. Add flour, baking powder, cream and melted butter. Mix gently to form a soft dough. Note: You may not need all the flour, so add gradually until you have a soft dough. Put the dough into a baking tray and spread by hand to cover the bottom to a depth of about 1cm (this quantity will make one large or two small cakes). Peel and thinly slice the apples into a bowl. Squeeze excess juice from the apples and sprinkle on top of the dough. Sprinkle with brown sugar to taste and add cinnamon if you wish. 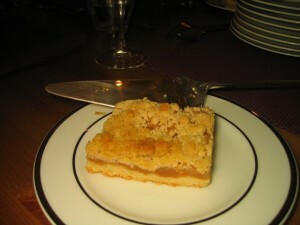 To make the crumble, melt butter, add sugar and flour and mix with fingertips to form a crumble. If it’s sticky, you may need to add a little more flour. Add some flaked almonds if you wish. Sprinkle crumble on top of the apples and bake for 50 mins – 1hour at Gas mark 6 or 180oC, depending on your oven. If crumble starts to brown quickly, cover with a piece of baking parchment.